Waking up at 2:22 p.m.
Every now and then I get hit with negative energy, sometimes the source being another person or sometimes myself. I've never understood how someone can hold such harsh judgments towards another. Why am I on the spotlight? It was said to me: "you are not person you seem. just a boy who can say nice words to a women, that's it! all you have is beautiful words." I put my life out there on the internet for anybody to see and this is the caliber of critique I should expect I guess. Lentil Wrap with Tomatoes, Onions, and Hummus. Salt n Vinegar Chips. Honey Oolong Tea. At the storage unit rehearsing Bamm Bamm songs with Josiah and Josh. Kofi sits on the futon couch as a bystander. Then to Thai Pan off Holland Road for the Punk Rock Show. 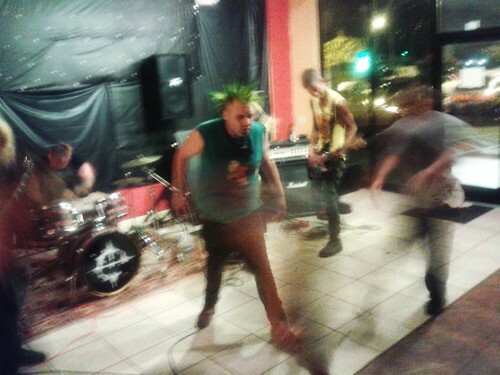 In between the thrashing street punk bands I perform with Bamm Bamm. Even though our style isn't exactly punk, the rock n roll garage sound is still well received. With Ana, Bianca (Josiah's girlfriend), Kofi, Laron, and William Clark. A few bands from Pennsylvania go on next. A mosh pit opens up – bodies get thrown around – there's slam dancing – and a general acrobatic mayhem. I stay on the sidelines pushing anybody that gets thrown my way. The lead man with green dyed liberty spikes yells and spits into the microphone. Punk's not dead, at least here in this Thai restaurant. You could say these kids are just mimicking a scene that already happened but I prefer to call them revivalists. There's nothing wrong with identifying with a decade that you missed out on. I remember this kind of angst when I was in my early years of high school. I went to a lot of punk rock shows. I followed the same image for a while. It was something to latch onto when your identity is in crisis. And now I'm witnessing it again. It's hard to believe punk rock has survived this long, even if it's not original. Watching Leaving Las Vegas (1995).